One of the surest ways to reduce the risk of osteoporosis and to build bone and muscle strength even if you already have osteoporosis, is exercise. Exercise helps to build and maintain strong bones, reduce risk of falls and fractures, as well as speed recovery from an osteoporotic fracture. 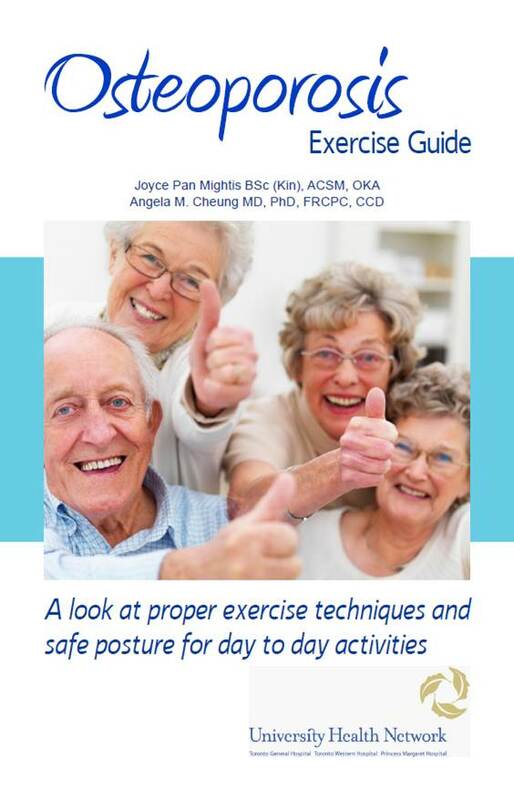 For a detailed guide on proper exercises for osteoporosis, please refer to UHN’s Osteoporosis Exercise Guide, a unique book written specifically for people looking to prevent and treat osteoporosis. Just like muscles, bones will become weak and deteriorate if they are not used. Physical activity provides our bones with the “stress” they need to grow stronger. Weight-bearing activities like walking or climbing stairs force bones to bear more weight, and weight lifting exercises provide bones with a greater load than what they normally experience. Both types of exercise can help in maintaining and even increasing bone strength. Apart from weight-bearing activities and weight lifting, certain exercises can help you to improve your posture and strengthen your muscles so you are less likely to fall and break a bone. Tai Chi, for instance, helps to develop stronger muscles and improve balance. Exercise can also help in relieving pain related to osteoporosis, including chronic pain in people who have had vertebral fractures and have a curved spine (kyphosis). By targeting and strengthening the back muscles, your spine can become more upright. New fractures may also be prevented by such exercises. Be sure to consult with your doctor before starting an exercise program. If you have a heart condition, chest pain, shortness of breath, dizziness, high blood pressure or a bone or joint condition, you should talk to your doctor before starting any exercise program.